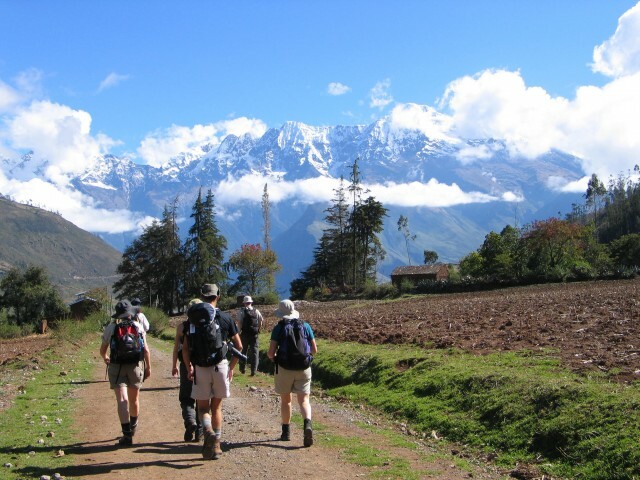 This 4 day adventure does not take you to Machu Picchu but to another large Inca Site; Choquequirao. Choquequirao means “the Cradle of Gold” and is an Inca site with a size that is almost comparable with that of Machu Picchu but does not have the number of visitors Machu Picchu receives. The site can only be reached on foot and parts of it are cleared and other parts still overgrown by nature giving it a very authentic flavor. The hike takes two days there and two days return. Ideally one can add one more day in order to discover the true extend of this site. For the true highland hikers this site can be combined with Machu Picchu in a week long hike. 4.00am we depart Cusco to arrive at Cachora town around 9am. Today we have a 7 hour hike ahead of us, stopping for lunch in a place called Capulioc. During today's walk we will observe Apurimac canyon with its impressive depth, amazing views of mountains, peaks and a semi-tropical valley. We will set up campsite today in Chikiska. 5.00am wake-up then the trek will lead us to the great ruins of Choquequirao (3,577m) where the view itself justifies the great effort of today. Here you will see 3 levels of excavated ruins, where we will have some time to explore parts of this late magical Inca town, sacred fountains, and 'torreones'. If we are lucky, we might even spot "the flight of the condors". 5.00am breakfast and we walk towards Playa Rosalina again then onto Santa Rosa (2100m) for lunch. We will spend the night at the same campsite of Chiquisca. Breakfast at 5am and we continue to towards Cachora town, trekking in front of the amazing snow-covered Padrayoc Mountain. We will arrive to Chachora around 5pm and take the bus to Cusco. On arrival in Cusco you will be taken to your hotel.